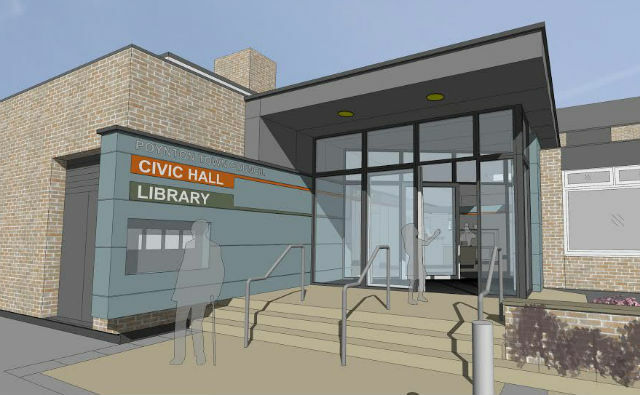 Following the work to refurbish and insulate the Civic Hall roof, work will begin in January to create a new modern entrance into both the Civic Hall and the Library, with a reception area that will serve both buildings. The project is expected to be completed by end-May. This joint Cheshire East Council and Poynton Town Council initiative will provide residents and visitors with improved access, new public toilets, a more efficient library, information service, and council facilities, as well as a modern building that can fulfil its important role as a community hub. The opportunity will also be taken to reconfigure the Civic Hall, with three new meeting rooms created from former offices and the existing reception area. The layout of the Library with also be modified and updated, with self-service machines that will enable users to borrow, renew and return books and other items. An additional self-service machine in the new reception area will allow the return and renewal of items when the Library is closed and the Civic Hall open. Designs are also being worked on for a planned memorial garden to better utilise and improve the space outside the existing Library entrance.